AGMAX’s commercial rotary hoes suit tractors from 35hp to 110hp. AGMAX heavy duty (HD) rotary hoes are solid machines that are suited to professional applications where high performance is demanded. Ranging in size from 4′ to 6’7″ and offering many features that are usually the domain of far more expensive machines, the AGMAX HD series offers tremendous value for farmers who want performance at a very competitive price. At approximately $3000 cheaper than a comparative machine, the AGMAX HD series of rotary hoes offers superb value for money. Each model has a 90hp, multi speed gearbox that can be adjusted for different soil types. Each model has a 90hp, multi speed gearbox that can be adjusted for different soil types, desired tilth, manure incorporation and optimisation for specific legume, pasture, cereal or horticultural crops. All AGMAX commercial hoes have side, oil bath gear drive for maximum durability and efficiency of power transmission. All chains have been replaced with gears which ensure an efficient power train and greater power to the ground. AGMAX commercial hoes are suited to professional applications where high performance is demanded. 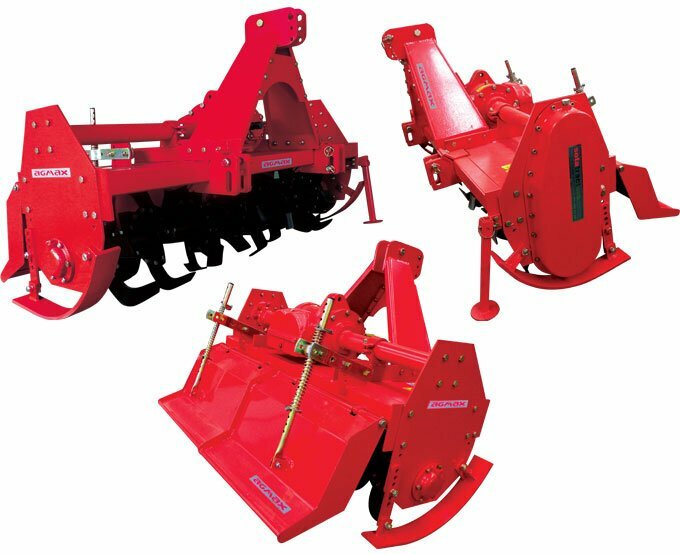 The head stock is available in CAT 1 or 2 and is fully movable to accommodate tractors of various widths; the desired seed bed can be laid without leaving tyre tracks. Skids and tracks are adjustable as well, which is essential for creating a seed bed of a required depth. The rotors are drilled for four or six blades and are equipped with six blades as standard. The AGMAX HD series offers tremendous value for farmers who want performance at a low price. The 90hp multi-speed gearbox on the AGMAX RH130 HD rotary hoe. The AGMAX HD series are well made, heavy duty rotary hoes that have been designed with performance and durability in mind. At approximately $3000 cheaper than a comparative machine, the AGMAX HD series of rotary hoes offers superb value for money. From left to right, top to bottom: RH178, RH152 and RH130 commercial rotary hoes.